Use this press break to attack the opponent’s full-court press. This press breaker is usually very effective and is simple to teach and execute. See the diagrams below. O3 is the in-bounder and should get the ball out of the net quickly and try to get the ball in-bounds before the defense can get their press set. Do not set up right under the basket, as the backboard may prevent you from making a long, overhead pass. The pass should go to O1, our point guard, who should be able to make the right decision whether he/she can beat the press with the dribble, or make the pass up the sideline to O2, or in the middle to O4. The pass back to O3 is another option, and O3 should always stay behind the ball as a safety pass backwards. O5 goes long and will eventually end up at the right low block, just like in our secondary. In fact, if the point guard can beat the press, then we should flow right into our secondary break with O2 going up the right sideline, O4 out to the left elbow-three-point line area and O3 trailing up the middle. If the in-bounds pass goes to O1 on the opposite side (same side as O4), then O4 stays up the sideline and O2 flashes to the middle (just the opposite of the left-hand diagram above). O2 and O4 must count to two. If after 2 seconds, they see that we are having difficulty getting the in-bounds pass into O1, then O2 and O4 cut hard, all the way to the baseline if necessary, looking for the inbounds pass (see the right-hand diagram above). Then immediately look for the pass in the middle to O1. Here is a secondary break that works well with this press breaker. The two are very similar and are easy to teach together. 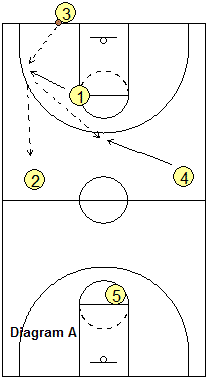 With the press breaker, O2 and O4 at half court realize the press is in effect and run the press breaker as seen above. But if the opponent is not pressing, then O2 and O4 simply "release" long up the floor as seen in this secondary break.